anxious to get your Althea parcel? 1. When can I get my parcel? Althea says it takes 10 - 15 working days for shipping and delivery to take place. This means public holidays and weekends are not included. Your late night shopping does not count as day 1, it will be processed the next day. 2. How does it work from Korea to Malaysia? 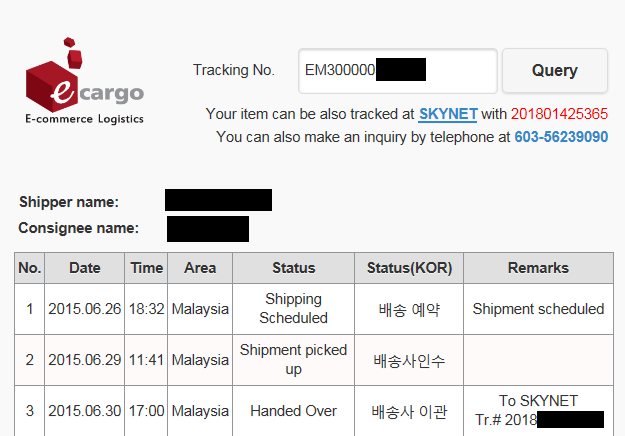 Althea ships your package from Korea to Malaysia and it will be handled by a local courier company, currently managed by Ta-Q-Bin (some areas are handled by Skynet). 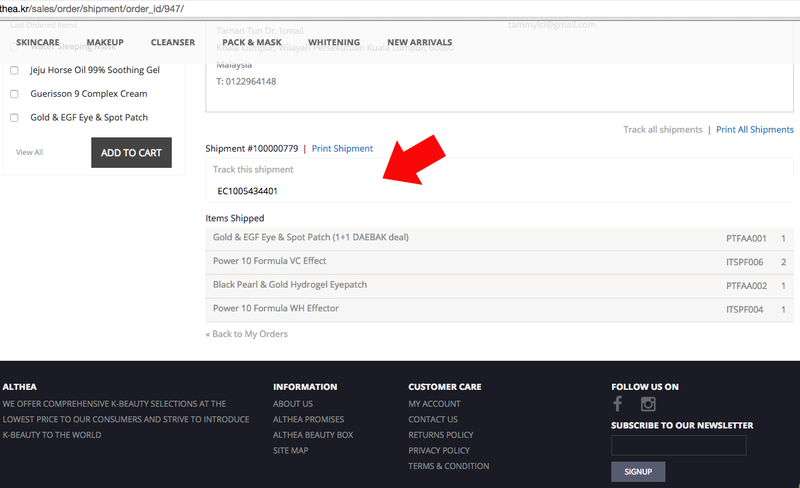 Althea has upgraded their e-tracking system to include your local delivery tracking number which can be found under "REMARKS" section. I made a simple guide for you to follow. Please refer below. 4. Skynet (or courier) says my tracking is invalid! The courier company does not track your e-cargo tracking number which is your shipping tracking number from Korea to Malaysia. The courier company will generate a new tracking number when the parcel reaches them and is processed for delivery. If you don't have the tracking number, it just means your parcel is not ready to be delivered yet. Don't waste time calling them to get tracking number. You will get your parcel from Skynet and if you do not get it, Skynet leaves a notice for you to arrange for second delivery along with your tracking number. 5. Why does it say failure to deliver when I am at home / office /etc? No, it's just a standard update used by Skynet to say it's not ready to deliver. Not they have failed to deliver your parcel to you. If they have failed due to reasons you're not home, you will get a notice from them to arrange for second delivery. 2. 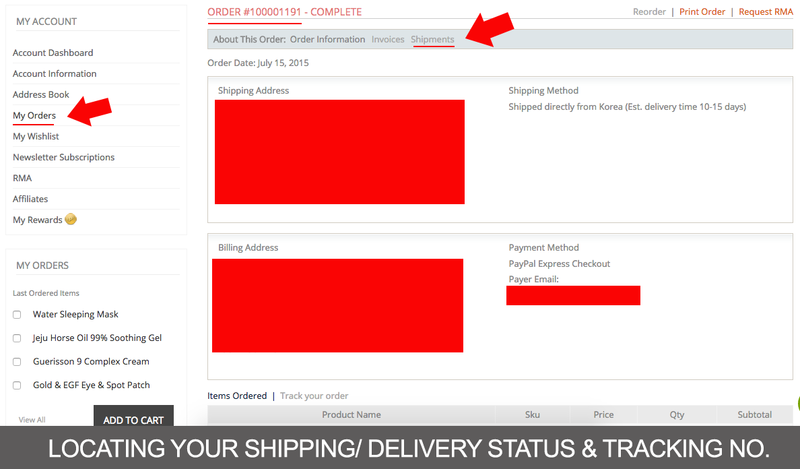 Under your account, find "My Orders"
You will only get to see your local delivery tracking number when it reaches the local courier company, who will update the tracking number on this history list. If you do not see it, it means it's not updated yet and you will need to wait. 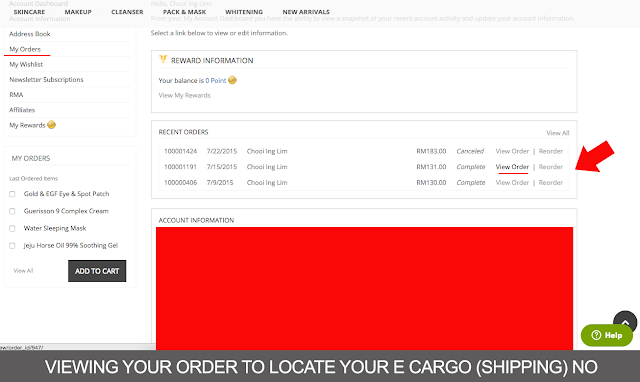 Update Sept15 Skynet does not update tracking number, they will deliver your parcel to you when they receive it from E-cargo (shipping). Do not waste time to email / track it until Skynet delivers it. Should they fail to deliver your parcel because you're not home / etc, they will leave a notice for you to make a second delivery or you can pick up from Skynet location stated in your notice. I don't care, I want to know my courier delivery status / tracking number from Skynet! So here is what you do, e-mail help@althea.kr and the customer service prince will check with Skynet for your tracking number (takes time) and update you. Use the tracking number given and go to http://www.skynet.com.my and check for shipment tracking. You may also contact Skynet at 603- 56239090. If you have waited long enough (past the 15 working days for delivery) you are advised by Althea to e-mail in to help@althea.kr to report. The help team will investigate and assist you on this matter. You may, to speed up things contact the local courier company directly to inquire on the status of your parcel. Leave me comments if you need to ask any questions or if I missed out anything here. This version will be updated from time to time. but taQbin received a lot of complaints also. I think all courier service in Msia sux big time. I am really annoyed with these courier service. They won't call as it's not their duty to call as all details should be given correctly (that's what they will say). I really wish a competent delivery company could come up in Msia and beat the rest to pulp. i accidently order it on saturday so do i have to wait until monday or the order doesnt count...sorry for my bad english. Spritzer Hot & Warm Water Dispenser Giveaway!